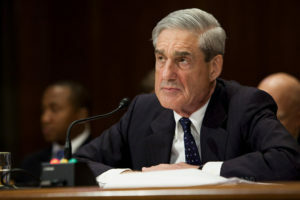 POLITICO originally reported in October that Mueller’s team — which is investigating whether the Trump campaign coordinated with Russians trying to influence the 2016 election and whether President Donald Trump tried impede the ongoing probe — had been dragged into court by a witness battling a grand jury subpoena. POLITICO discovered the Mueller connection after a reporter sitting in the court’s clerk office overheard a man request a document in the case from the special counsel’s office. The man declined to identify himself or his client when approached by POLITICO. Since it was filed in August, the sealed case has moved with extreme speed back and forth between the DC District Court and Circuit Court of Appeals. “At every level, this matter has commanded the immediate and close attention of the judges involved—suggesting that no ordinary witness and no ordinary issue is involved,” former federal prosecutor Nelson W. Cunningham wrote in an op-ed for Politico. He speculated that it is the president, but Trump’s lawyers and Trump himself denied it. More anticipation had been building in recent weeks about who had gotten the subpoena after a series of additional tantalizing clues were filed in the docket, including sealed multi-page briefs and sealed letters updating the judges on recent events affecting the case. Friday’s long-scheduled oral arguments had long been seen as the best opportunity yet to identify the litigants. More than a dozen reporters lined up in the hallway outside the courtroom about an hour before the first of three cases were set to be argued before U.S. Court of Appeals Judges David Tatel, Thomas Griffith and Stephen Williams. Reporters and members of the public were free to enter the courtroom during the first two cases. But the secrecy clampdown quickly followed as the court shifted gears to the sealed grand jury case. A security officer wearing blue rubber gloves checked the chambers for any devices left behind. The live audio feed went dead. And then the clerk kicked the journalists off the entire fifth floor. After about 90 minutes, court security officials allowed the journalists to return to the fifth-floor hallway, where the courtroom doors were still closed. A few minutes later, reporters spotted the judges walking back to their offices. No one with any apparent ties to the case were spotted leaving the building. [On] Friday, court officials went to extreme measures to ensure it was as difficult as possible to figure out what Mueller’s team was doing as the US Court of Appeals for the District of Columbia Circuit held a secret and mysterious argument about a grand jury subpoena challenge. So CNN got bupkis too. Well, something important happened today, but only the parties to the litigation and the judges hearing this case know what it is about.